But now I’m not. I was, just last week, but not any more. It’s weird. It’s unsettling. I’m trying to adjust to the new normal. Yesterday was an especially difficult day as a delivery crew got aboard our Sabre 386 Esmeralde at our slip at New England Boatworks, and after a startlingly brief orientation, sailed her away to her new temporary home in Yarmouth, Maine. Bruce and I went to Fort Weatherill State Park, a few steps from our home, and watched her sail out of Narragansett Bay with someone else at her helm for the very first time. It was a painful moment. Esmeralde in Northeast Harbor, Maine. We have enjoyed exceptional adventures on board Esmeralde. Ten (or so) cruises to Maine. Three Newport-Bermuda races, double-handed. Countless weeks and weekends poking around the New England coast. Good friends. Fun times. Squabbles. A lot of work. Good weather. A few storms. Great sailing. Deadly motoring. All great memories, all now filed under “Has Been”. Esmeralde at the start of the 2006 Newport Bermuda Race. Sabre build quality and the Jim Taylor design pedigree, she was (is!) an outstanding boat. She met and exceeded our every expectation. She was comfy, quick, well built, good looking, and gratifying. We enjoyed her immensely and cared for her carefully. She was a lucky girl. Here is a old video from our first Newport Bermuda Race. Apologies for the poor quality. This past spring, while I was delirious and still under the haze of anesthesia and narcotics from my Total Shoulder Replacement surgery, Bruce somehow convinced me that it was time for us to step over to the dark side and get a power boat. He had a plan. We’d have a great time. We were getting an American Tug. Before I knew it, the deal was done. Cheers! I can’t complain. I will love the new boat, just as I loved the Sabre. And the Able before that. And my Bianca before that. I sometimes have trouble with the “moving on” thing, but I do move on and will eventually adopt the new normal as a good happy place. Esmeralde is for sale. I have built a photogallery of her for our memories. You can see her listing on Yachtworld. What a time of transition for you both. I can certainly understand the emotion tied to this. Change is never easy, is it? Much luck in your new endeavors and adventures! Hey Becky, I can’t complain about my transition. We are very lucky. Thanks for checking in! xo. After 16 boats, and 30,000 Bluewater miles, we sold our Tayana 47/48 and bought a Grand Banks 42 To Cruise the PNW. 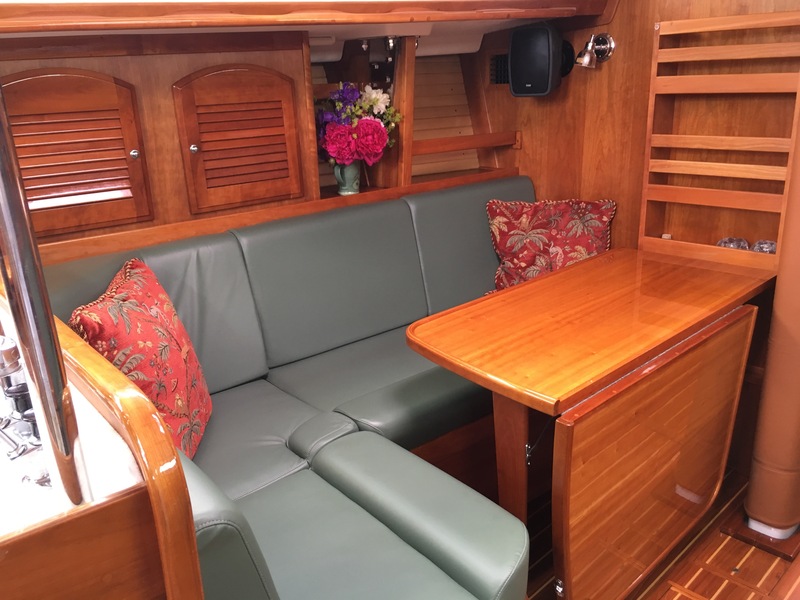 We miss the romance of sailing and the graceful lines of a fine sailboat, but also love our Big windows and bridge deck on the GB42. We recently found my dad’s Catalina 22 I learned to lake sail on, and are figuring out how to drag her along for cocktail sailing in anchorages. Your boats are beautiful and love the American Tug. The color is perfection. Bravo!